Mystery Motorola to bring ICS, Medfield chip to MWC? A mystery Motorola handset has snuck out of its pre-MWC 2012 holding pen and on to the web today, revealing Ice Cream Sandwich and Intel hardware as well as a neat new look. At first glance, you'd be forgiven for thinking that this unnamed handset is an HTC affair, given the rounded corners at the base and overall look – it certainly makes a nice change from Motorola's regular boxy affairs. But the big news is on the interior of the phone, with the handset said to be Motorola's first Intel phone running the Medfield platform as opposed to the company's usual TI OMAP processors. 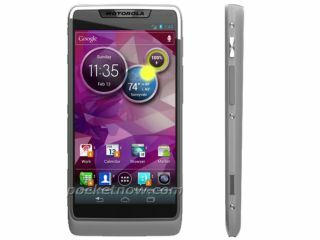 Software-wise, it's set to be Motorola's first Ice Cream Sandwich (Android 4.0) phone, and we're very much expecting to see it launch at MWC 2012 in a couple of weeks. There isn't much more to report on the spec front, but looking at the handset you can see that it's lacking in the button department, opting for soft keys instead of physical ones. PocketNow, which got the Moto scoop, suggests there'll be a hefty camera on board too, possibly with 15 fps burst capture. We'll find out all there is to know about this intriguing new Motorola phone at MWC 2012 – stay tuned for our hands on review.